AC Ryan Playon!HD media player could work as a NAS (Network Attached Storage), and the storage varies according to different model. For example, you will have up to 2TB internal HDD with Playon!HD ACR-PV73100, while there is no internal storage for Playon!HD Mini ACR-PV73200. Aunsoft Final Mate is the best M2TS merger on Windows 7 to get videos without video and audio synchronization problem. You will notice the lips match the audio perfectly when playing the merged m2ts on AC Ryan Playon!HD media player with HD TV. If you would like to merge .m2ts videos from camcorder without recoding in fast speed, the following guide will be useful for you to join and combine camcorder AVCHD files and export the merged files without conversion. Step 1. Capture videos from camcorder to Aunsoft Final Mate. Connect your camcorder to PC via USB 2.0 cable, and select the PC mode when you are asked to select the mode. Run Aunsoft Final Mate as M2TS merger for AC Ryan HD media player, and follow the camcorder wizard to import videos from camcorder to Aunsoft Final Mate. Step 2. Merge M2TS files for AC Ryan media player. 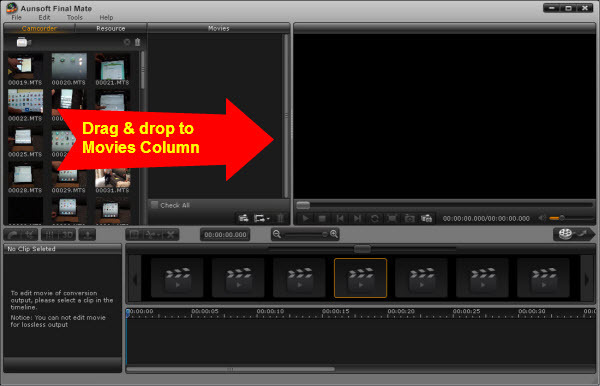 The videos recorded with the same recording mode can be created as one movie with the program. Drad and drop the source files to Movies Column, and then tick off the checkbox before "Create A Single Movie" to join them into one file. Step 3. Export M2TS raw files. Click the "Export" button to start merging .mts files into one file. All the mts clips will be created as one file as output. 1. Besides AC Ryan PlayOn!HD media player, you may also lossless merge m2ts files from camcorder for HD media players or media center applications like WD TV, Xtreamer Pro, Popcorn Hour, PlayStation 3, XBMC, MythTV, Boxee, TVIX, etc. 2. Aunsoft Final Mate currently only supports the .mts and .m2ts files from camcorder. If you have m2ts backup from Blu-ray movies or VC-1 codec, it could not be imported yet. Look forward to the future update about more codec support for m2ts files. How to Convert and Enjoy AVCHD MTS/M2TS Files in HDTV?